Driver Mintu Pandher sits in his truck at A&C Truck Stop outside Laramie, Wyoming. The trucking industry is facing a record shortage of drivers. However, over the last couple of years, one demographic has been gravitating towards the industry by the thousands: Indian-American Sikhs. The closest town to A&C Truck Stop in southeastern Wyoming is 20 miles away. Mintu Pandher has been a trucker for 16 years. But a few years ago, he decided to buy this truck stop as well. "Everybody said it was good money and it's hard work," he said. He made a few changes. One small building that used to be a fireworks stand is now a modest, one-room Sikh temple. Pandher built the temple to accommodate the growing number of Sikh truckers traveling through his truck stop. According to the political organization, Sikhs PAC, the trucking industry saw that demographic rise by 18,000 in 2017 alone. The temple gets used on a regular basis by drivers, but Pandher said he was especially glad he built it one spring, a couple of years ago, when some very weary travelers showed up. "They were bikers. They were coming in May. They were coming from California. They had no idea that Wyoming gets snow in May as well," he said. There were twenty of them and Pandher said they were headed to Iowa for a funeral and a rally. "So they were sitting on their bikes at night and it was snowing. So we opened the temple and we told them to sleep. And they slept all night," said Pandher. "They didn't even wake up until next day's afternoon." For Sikhs like Pandher, trucking is an attractive blue collar job because it doesn't interfere with their beliefs or traditions. "You don't have to go cut your hair," he said. "You don't have to take your turban off. You don't have to lose your faith while you're working hard." In fact, Pandher said days spent on the road reaffirm his faith. "The biggest thing in Sikhism is service, serve other people. So there's no other industry that you can better do. Because when you drive a truck, you deliver something, so it gives you the satisfaction. If you deliver food, you deliver fuel—anytime you drive a truck the ultimate destination is the delivery," he said. The soundtrack to his shift in the freight industry is Indian pop music. Surjit Khan's hit song Truck Union has over 2 million views on YouTube and Pandher said: "trucking is actually becoming a pretty hip industry in the Sikh communities." Khan's music video features turbaned dancers in flashy garments spinning in front of a row of shiny semi-trucks. The lyrics describe working as a trucker as a straight shot to the American dream. Mintu Pandher said a lot of Sikh truckers listen to it on the job. "You can listen to music all day while you're working. How many other jobs you can? Not too many," said Pandher. Still, overall, Americans wanting this type of lifestyle is going down. And it couldn't happen at a worse time. Demand for trucking services are up with online delivery companies like Amazon Prime becoming more and more popular. "Trucks haul 70 percent of all the freight tonnage in the United States," said Bob Costello, the Chief Economist with the American Trucking Associations. Right now, he said trucking companies have a hard time hiring enough new people to keep up with the demand. And if the current trend continues, Costello said the shortage of drivers could surpass 174,000 by 2026. He said Sikhs entering the business could lighten the load. "Now that's not going to solve the problem alone, but it's one of those things that will help a little bit," Costello said. Another bit of help: sweetening the deal for truck drivers generally. "We saw pay increases every six months last year, right. We also saw things like, 'Hey, come work for me. After you've been here for a little while, I'll give you a sign-on bonus,' and many times that's thousands of dollars," said Costello. But Costello added that if it was all about money, it would be an easy problem to solve. "When you become a truck driver especially a long, haul truck driver," said Costello, "this is a lifestyle choice that you are making." That means long hours behind the wheel, sleeping in the cab of your truck, and long stretches of time without a home cooked meal or seeing your family. 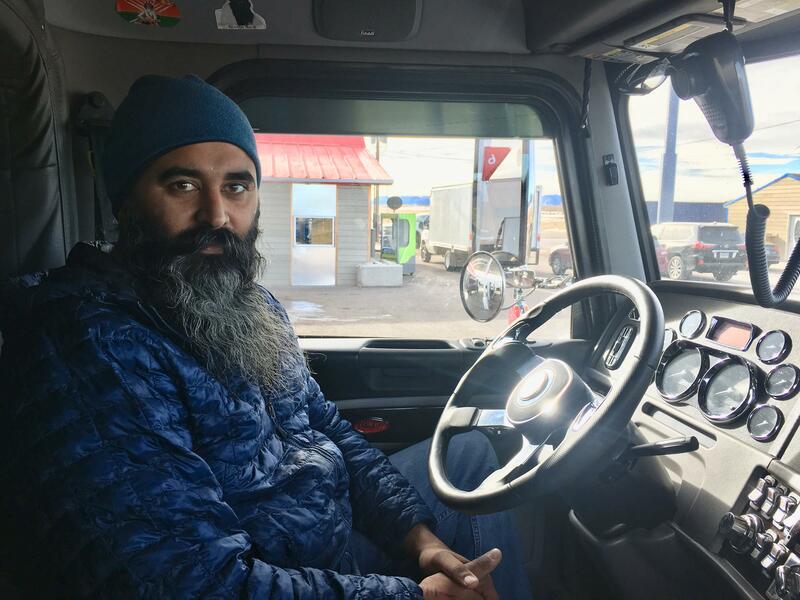 But back at his busy truck stop, Mintu Pandher said there are definite benefits, too, like the different states and vistas he gets to see, and the mountain passes where he often parks his rig for the night. "Sleeping on 12,000 feet, 11,000 feet. That's basically like sleeping in the clouds," Pandher remarked. Pandher drives mostly short distances these days, and spends fewer nights on the road. That means more time spent managing the gas station. So Pandher expanded services, he's added an Indian food restaurant to the truck stop. Past the swinging door and into the kitchen, you can hear the hum of the traditional clay oven used in Indian cuisine. And the menu is pretty extensive: naan, lamb korma, tikka masala, and mango lassis among other things. This way, Pandher said when a Sikh driver stops for fuel, they can also get a meal that tastes like home.